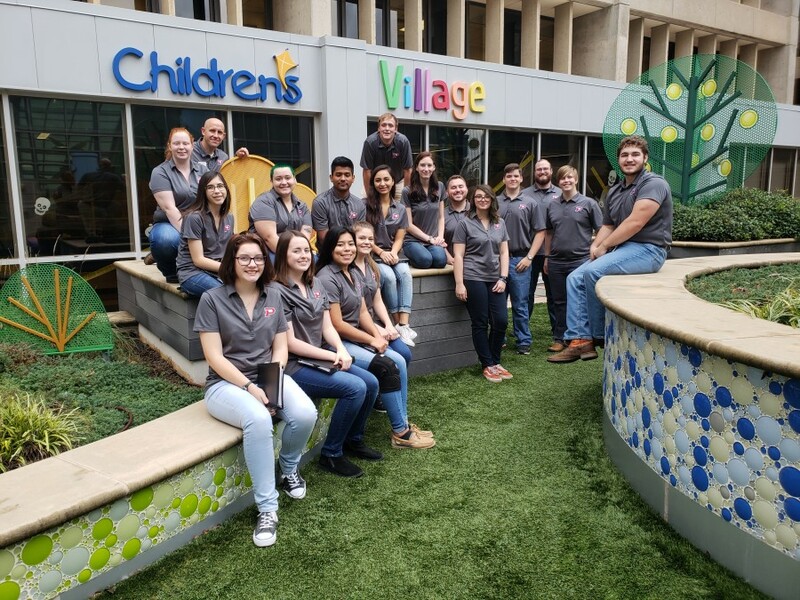 Goodwell, Okla. — The Oklahoma Panhandle State University Chamber Singers recently took a two-day “Kids and Cancer” tour with performances across the panhandle area as well as at the Jimmy Everest Center and the OU Children’s Hospital. The group left on Thursday, October 25th, first stopping at Beaver, Okla. and performing for students from pre-k through 12th grade in honor of a preschooler battling Leukemia. After dedicating the performance to her and those who are supporting her fight, they got to meet her and get a photo with her. The next stop was in Alva, Okla. at Northwestern Oklahoma State University (NWOSU) for an exchange performance with their choir and a service project. Both school groups performed for the other school and received critiques from their director. Before leaving Alva, the two choral groups made cards, signs, and goodie bags to deliver at one of the planned stops, OK Kids Korral. The tour continued and the next performance was at the Jimmy Everest Center within the OU Children’s Hospital where they performed for the staff and enjoyed a tour of the facilities. Shortly thereafter, they performed in the main entrance of the hospital for parents and families enjoying a meal provided by a local hotel. They then assisted with some cleaning in the “Kids Zone,” interacting with patients, and assembling coloring packets for patients. The following morning saw a service at the Kids Korral in Oklahoma City, making breakfast for families and setting up for an event before heading back to the panhandle. The final stop was in Balko, Okla. in honor of a fourth grade student who recently won his fight with cancer. “We wanted to end on a high note, where we could celebrate a battle fought and won, and it was great to meet the young man who had done just that,” said Wilkins. An elite group, students must audition and be selected as a member of the Chamber Singers. They are a highly visible ensemble that gives at least four performances every semester, with frequent off-campus and out-of-class obligations including recruiting visits to area schools and churches and a tours. Chamber Singers provides vocalists with additional performance experience in a select ensemble. Repertoire may include music drawn from all eras and styles, with emphasis on the a cappella vocal tradition of the 16th through 20th centuries. Chamber Singers include Chloe Bley, Stacy Jimenez, Madison Judd, Kaylee Johnson, Kristen Perks, Kaley Conner, Grace Sparkman, Maxine Henderson, Darily Carrillo, Jessica Wilkinson, Jax Liebman, Tyler Pfrehm, Jorge Vielmas, Jacob Long, Conner Beims, Reece Player, and Jacob Schmitt.